OUR PRIORITY IS TO SERVE & RESPOND TO YOUR NEEDS! Quality is not imposing a pre-conceived model or process on any given Corporation or its systemic processes. It is however a great deal about listening to the Customer and hearing the story they tell about the experiences they need help to improve, resolve, add or remove. 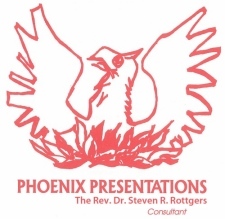 That is why Phoenix programs are built-to-order from direct input we gather from personal interview with those who have discerned the need for guidance, help, and additional insight training. The listed topics are just a sample of items that can be drawn together to build a creative, responsive, and enjoyable program that is uniquely just for you, your organization/corporation and those who staff your workplace. It IS All About You, Your Customer's Perception and Your Systemic Process When It Comes to Quality in the Workplace, Not What Someone Wants to Sell You! Meals per Hour: Quality Systems Theory not only works for Business, but for Non-Profit as well! Self Improvement- It starts with "I"! Change for the Better-What's that mean? Improving Sales - Know Your Customer! Knowing the Customer-Where to look! Relational Power-It's all about People! Vision to Action-Make it Real! Loss Functions-What are We Losing?! * Seminars are created to respond to Your need and time-frame. Schedule and Designed Your Seminar to range from an hour, a couple of hours, one day to a multi-day retreat, or even as an on-going class. * Group size is flexible, yet does define the format and the amount of topics that may be covered in the available time. * Classroom formats or Participatory Retreat formats are available. * Fees are Flexible, including hourly, daily or block rates. They DO NOT Include presenter travel, housing, and meal expenses. Those items are additionally billed at exact cost. CHOOSE A SUCCESSFUL SEMINAR - OR - DESIGN YOUR VERY OWN ! * The above list of Topics and Seminars are only a sample of possibilities that can be chosen to build a unique event for your organization. * Don't feel limited only to these - the Listings on our Programs & Topics page just may meet your need -so check them out! CONTACT US SO WE CAN GET STARTED ! Contact us so we can start hearing your story and defining your needs! We will help you solve your challenges and celebrate your successes!